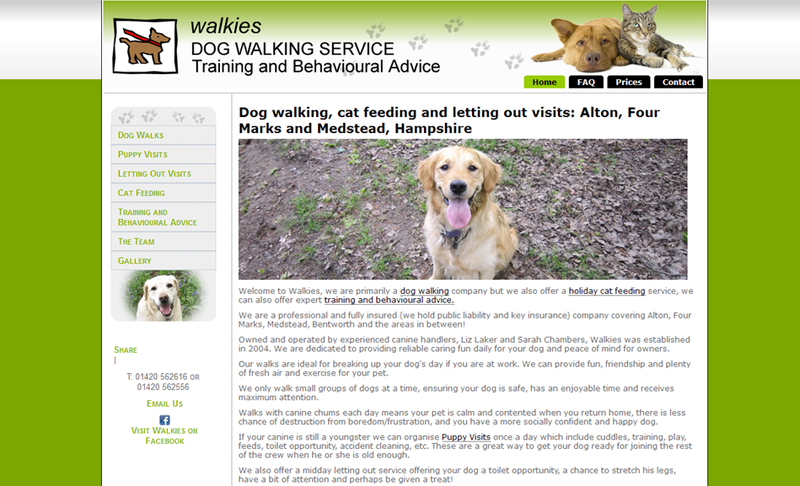 Walkies Dog & Cat is a specialist service providing dog walking, training and behavioural advice, as well as cat feeding and letting out visits in the Alton, Four Marks and Medstead area of Hampshire. Established in 2004, the business is owned and operated by experienced canine handlers, Liz Laker and Sarah Chambers. When they approached M35 Web Design, Liz and Sarah only had a very old, basic DIY template website, and wanted something more up market and stylish to attract new business. M35 Web Design designed and created the new site, choosing a bold, bright green as a background for text on a white central area. Photographs of customers’ dogs at walk and at play were supplied by Liz and Sarah. The site is updated regularly by M35 Web Design and is doing well in search engines. Google Analytics provides Liz and Sarah with website visitor statistics.